Last week there was only one crocus. This week there is a whole bunch. Spring must be here! finally! I love you shawl as well. perfect for spring. I’m still not convinced that winter is over. Hopefully. Have a wonderful weekend! I know it’s spring b/c our landlady was Windexing the plastic encased baby Jesus statues in our yard and “planting” her fake flowers. Did I mention our landlady is a little old italian woman?? We can hope! The flowers are so pretty. Have a nice weekend. 80 degrees here today….WooHoo! Have a wonderful weekend! I’m jealous. I don’t see anything resembling blooms in my yard. The weather says spring, but I’m not seeing it just yet. Maybe if I had actually *planted* crocuses, I’d have some too. Note to self…. Most of our ground is still burried! Lovely. I’m just itching to see the first blooms of the spring. If there are any crocuses in my garden, they’re still buried under a foot of snow. It’s melting fast today, but still, I WANT GREEN!! Yeah for spring! I noticed some daffodils blooming in the boulevards around town this week, but I was driving so no pics. The flowers are great, but I’m still in awe over the shawl……. I did feel spring in the air yesterday evening! What? No snow surrounding your crocus? I’m jealous of your spring flowers. Most bulb plants don’t bloom here since it doesn’t get cold enough for them in the winter. So, see it is good to live somewhere cold because you get prettier flowers to look at in the spring. Hey! 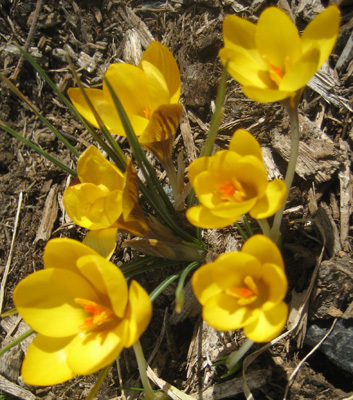 Now _you_ have some crocus! Glad the snow finally melted. 60 here!! If only the doggie doo-doo would clear itself maybe something would pop up this weekend! Your Seraphim shawl is stunningly beautiful. An achievement to take pride in, spinning the lovely yarn and then the beautiful knitting. It is gorgeous. You look lovely in your red day dress. Happy Spring! Those would make a nice sock colorway. Growing up in a four season climate, crocuses have always been that bastion of new, and after a long winter, better times. It is amazing the level of joy that one can obtain from a small bunch of flowers – yay spring! I don’t have crocus in my garden, but my daffodils look much the same! We’re supposed to have temps in the low 70s all week…makes me hopeful spring is really here to stay. Very nice! We get sort of haphazard crocuses, but haven’t seen any yet.